How is the framework built within the hedge? 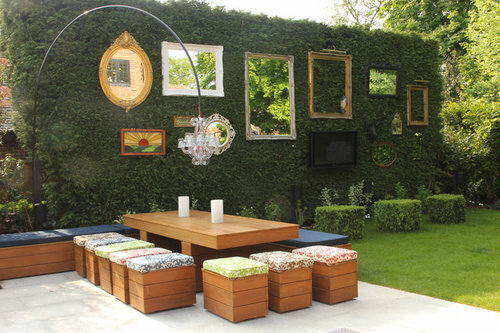 The picture frames and TV are suspended by a metal framework hidden within the hedge. Supporting arms protrude out from the frame which each item is securely attached too. I did see this answer previously. What I am wondering is HOW the framework was built within the hedge. What was it made of...is it a grid...was it built and the hedge planted around it.....are there plans for it ? The hedge was existing and we managed to design the framework around its branches and roots (with some patience and cunning!). The framework was made using lengths of aluminium tubing that slightly resembles a scaffolding platform. Are you looking to build something similar? A very large home was built next to us and we now have absolutely zero privacy. This was so lovely, I thought something like it could work for us. There's a number of ways to help improve your privacy and better screen the new build next door. I'd be happy to discuss The Gallery Garden idea or other suitable solutions if you thought it would be useful? Feel free to get in touch directly if we can be of any further help. Have a great weekend. What to do with his garden?